right Salesforce takes a lot of work. The good news is with the Nonprofit Success Pack (NPSP) tools described in this guide, you don’t have to tackle this complex, time-consuming project without some help. The NPSP provides tools to streamline the process and automate the translation of your data into Salesforce objects. If you’re used to working in Excel, think of Salesforce as many, many spreadsheets, all related to each other in specific ways, and all stored on the Internet. Salesforce is like a gigantic database in the cloud, and we commonly refer to the various “parts” of Salesforce as objects (contacts, household accounts, donation opportunities, and so on). You can see these as the tabs across the top of your Salesforce organisation. Even with the help of these tools, you need to budget enough time to go through the data import process properly. Data import is not something that can normally be done in an hour or two— it could take up to a month or more to go through all of the required steps, depending on the quality and quantity of your data. To get the data into Salesforce, follow these steps. 1- Clean up your existing data. Do this in your existing spreadsheet, database, or wherever you currently maintain your donor data. Getting your data in great shape for import is the most important step. It’s also the most labor-intensive. Maintaining data quality is hard. Your data may have been entered in different ways by different people, and may be incomplete or out-of-date. Additionally, you may not have been able to enforce data validation rules or consistent formatting with your previous tools. As you make the transition, your data must absolutely be highly structured and in the required format . Otherwise, Salesforce will reject it. Your data can’t have inaccuracies, inconsistencies, and duplicates. Invest the time now to clean up your data and your organisation will reap the benefits for years to come. 2- Transfer your existing data into a template that’s specially designed to structure your donor data for import. Use the spreadsheet file called NPSP Data Import Template.csv provided by Salesforce.org. You can download the template from here. Keep in mind that the fields in this template mirrors the fields in the NPSP Data Import custom object. If you have additional custom fields on Contacts, Accounts, Opportunities etc, they must be added to the template. 3- Upload data from the template into the NPSP Data Import custom object. 4- Verify the uploaded data in Salesforce. Check the fields in the NPSP Data Import custom object to make sure that your data uploaded correctly under NPSP Data Imports tab. 5- Run the NPSP Data Importer tool to complete the import. Start the NPSP Data Importer tool, which takes the organised data from the custom object and imports it into the NPSP as multiple objects, including contacts, accounts, and opportunities. By the time you’re done, your data will reside in the following multiple Salesforce objects created from the import process. 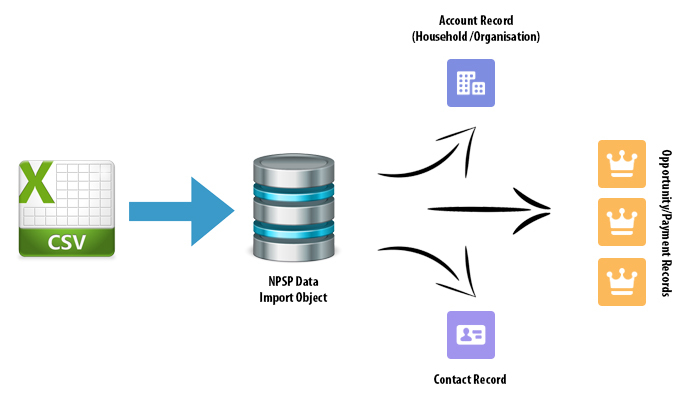 If you need to know more about Salesforce NPSP Data Import or get help for your data import contact us today.